An active and dangerous volcano on the island of Bali. Mount Agung viewed from the east and rising above the clouds. The caldera rim of Mount Batur is visible in the distance. During the 1963-1964 eruption, pyroclastic flows and lahars roared down these slopes. They traveled all the way to the ocean and killed everyone in their paths. Image copyright iStockphoto / adiartana. Click image to enlarge. Mount Agung is a symmetrical stratovolcano. Flat valleys below the volcano are filled with volcanic sediments from a long history of eruptions and runoff. Terraced rice farming is the leading agricultural activity. Image copyright iStockphoto / Alexpunker. Click to enlarge. Mount Agung, also known as Gunung Agung, is an active volcano located on the island of Bali in the Indonesia island arc. 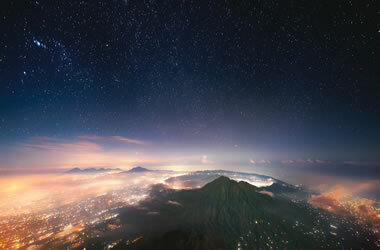 It is the highest point on the island of Bali at an elevation of 9944 feet (3031 meters). 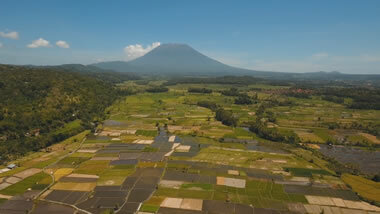 Mount Agung is a stratovolcano built by a long history of recurrent eruptions. The stratovolcano has been built up from eruptions that produced andesite lava, volcanic breccia, volcanic ash, and pyroclastic debris. Ash Cloud Over Mount Agung produced during the 2017-2018 eruption. The ash clouds rose high into the atmosphere, causing an aviation emergency that forced the closure of the Ngurah Rai International Airport. Image copyright iStockphoto / sieniava. Eruptions at Mount Agung can be deadly and present a variety of volcanic hazards to nearly a million people who live within a 20-mile (30-kilometer) radius of the mountain. The 1963-1964 eruption at Mount Agung was one of the largest volcanic eruptions of the 20th Century, rating VEI 5 on the Volcanic Explosivity Index. More recently, in 2017-2018, Mount Agung produced large ash clouds that rose to elevations of about 12,000 feet (4000 meters). These caused an aviation emergency and forced closure of the Ngurah Rai International Airport, ruining the plans of thousands of tourists and other travelers. 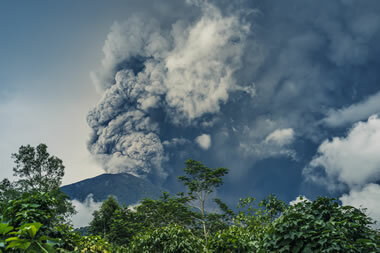 Fears of pyroclastic flows, lahars and ash falls caused the Indonesian government to order the evacuation of about 100,000 people who live within a 6-mile (10-kilometer) radius of the volcano. Potential Human Impact of an Eruption: This night photo, taken from the west slope of Mount Agung, shows the valley below and the caldera rim of Mount Batur in the distance. The number of night lights clearly indicate the population density of this area and the potential human impact of any eruption. Image copyright iStockphoto / jankovoy. Click to enlarge. Several volcanic hazards are present at Mount Agung. They are explained below, giving examples from previous eruptions where possible. During the 1963-1964 eruption an estimated 1700 people were killed by pyroclastic flows . These are superheated clouds of volcanic gas, volcanic ash, and rock debris. The clouds are denser than air, have temperatures as high as 1,830°F (1000°C), and can flow down the slope of a volcano at speeds of over 400 miles per hour (700 kilometers per hour). They destroy and incinerate everything in their path and can flow several miles (kilometers) beyond the base of the volcano before stopping. The only way to survive a pyroclastic flow is to be out of its path before it begins. After the 1963-1964 eruption, about 200 people were killed by cold lahars . These are mudflows composed of rainwater and volcanic debris from the eruption. Heavy rain falling high on the mountain saturates a thick ground cover of volcanic ash. A landslide, possibly triggered by earthquakes within the volcano, begins and accelerates as it travels downslope, picking up more material and momentum as it travels. The flow might then enter a stream valley with a velocity that is greater than the water in the stream. The moving mass grows as it sweeps up the stream water. The flow can continue down the stream channel at speeds of over 60 miles per hour (100 kilometers per hour) and travel over 120 miles (200 kilometers) beyond the base of the volcano. Plate Tectonics Map for Mount Agung: Mount Agung is located on the island of Bali on the Sunda tectonic plate, which is moving to the west-northwest at a rate of about 21 millimeters per year. The Australia tectonic plate is moving to the north-northwest at a rate of about 70 millimeters per year. The plates collide to form the Java-Sunda trench, where the Australia plate subducts below the Sunda plate at a relative velocity of about 70 millimeters per year in a north-northwest direction. Many volcanoes in Indonesia have been formed by interactions between the Australia and Sunda tectonic plates; some (but not all) of these volcanoes are shown on the map. The volcanoes of Java, Bali, and many other Indonesian islands have been formed by interactions between the Australia and Sunda tectonic plates. Mount Agung Plate Tectonics Cross Section Simplified plate tectonics cross-section showing how Mount Agung is located above a subduction zone formed where the Australia Plate descends beneath the Sunda Plate. Magma produced from the melting Australia Plate rises to form the volcano. At the Sunda-Java Trench, the Australia Plate subducts beneath the Sunda Plate and begins its descent into the mantle. The Australia Plate begins to melt when it reaches a depth of about 100 miles. Hot and molten materials then begin rising towards the surface and erupt to form the volcanoes of the Indonesian volcanic arc (see Plate Tectonics Cross-Section). Preliminary Report on the 1963 Eruption of Mount Agung in Bali (Indonesia): by M. T. Zen and Djajadi Hadikusumo; Institute of Technology Bandung, Geological Survey of Indonesia Publication; Bulletin Volcanologique, Volume 27, Issue 1, pp.269-299, 1964. Seismicity of the Earth 1900-2012 Java and Vicinity: by Eric S. Jones, Gavin P. Hayes, Melissa Bernardino, Fransiska K. Dannemann, Kevin P. Furlong, Harley M. Benz, and Antonio Villaseñor; United States Geological Survey Open-File Report 2010–1083-N, 2014. Smithsonian Institution Global Volcanism Program Website: Agung page. The subduction zone is a source of recurrent earthquakes. Many of these earthquakes cluster around the descending Australia Plate. Others accompany molten material rising beneath the volcanoes. Some are associated with deformation of the Sunda Plate and portions of the Australia Plate that have not been subducted. Strong earthquakes near the leading edge of the Sunda Plate can sometimes displace enough seawater to produce a tsunami.